We first caught sight of Samsung's GamePad back around the launch of the Samsung Galaxy S4 only for it to go AWOL, but now, finally, it's heading to stores and should be available in the UK within weeks. The Samsung Smartphone GamePad has changed a little in the months since we last saw it. It's now black rather than white and the button layout and design has been changed slightly, but its purpose (allowing users to play mobile games with console like controls) remains the same. The GamePad is optimised for Samsung devices running Android 4.3 or above, but it works with any phone or tablet running Android 4.1 or higher and it connects through Bluetooth pairing. It can even be clipped on to any handset that's between 4 and 6.3 inches. Plus with the addition an HDMI cable or AllShare Screen Mirroring you can connect your phone to a TV screen and get something approaching a true console experience. At launch 35 games are optimised for use with the Smartphone GamePad, including Asphalt 8 and Virtua Tennis Challenge, but many more are promised for 2014. Mobile gaming has grown substantially over the years and with a big name like Samsung supporting it there's every chance that it will become even more popular. 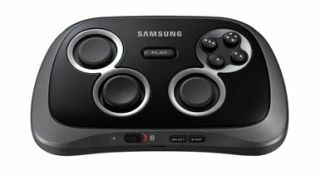 Having said that, if you're looking into buying a smartphone game pad Samsung's offering isn't the only one out there. MOGA for example have been on the scene for quite a while and have several such devices to their name. Only time will tell whether Samsung's brand power will make it the leader of the pack, and without a price to go on thus far we're left wondering just how many GamePads will sell. Looking for something similar for an iPhone? MOGA has you covered.